To get to the trailhead, take Rt. 125 west of town, and shortly before entering the the village of Bridport (in other words, if you get to Bridport, you have gone too far), take a right turn on East St. After 4 miles on East St., there will be a parking lot on your left which is provided for those enjoying Snake Mt. I am told that if you are approaching this parking lot from the north, the same road is called Mountain Road. Some kind of turf war between Addison and Bridport perhaps? Start the run, heading back south on East St./Mountain Road for a few hundred yards, passing by a small abandoned building on the left, and then take a left turn on the obvious trail by the gate. Pay no heed to the No Trespassing signs, as these are for the adjacent fields, not the trail! The first third of the run climbs gradually to the east. This section was pretty dry this August, but the numerous side trails attest to the quagmire status of the main trail earlier in the season. The second third of the run begins with a sharp left turn, and a rather relentless climb angling up the side of the mountain to the north. Make a mental note of this turn, as less alert runners and hikers sometimes miss it on the descent and end up much further from their parked car than they had hoped. A short dip as the trail reaches the summit ridge provides a moment’s relief, before heading up the last third of the run, consisting of a series of short steep climbs, longer flat sections, and a few switchbacks. 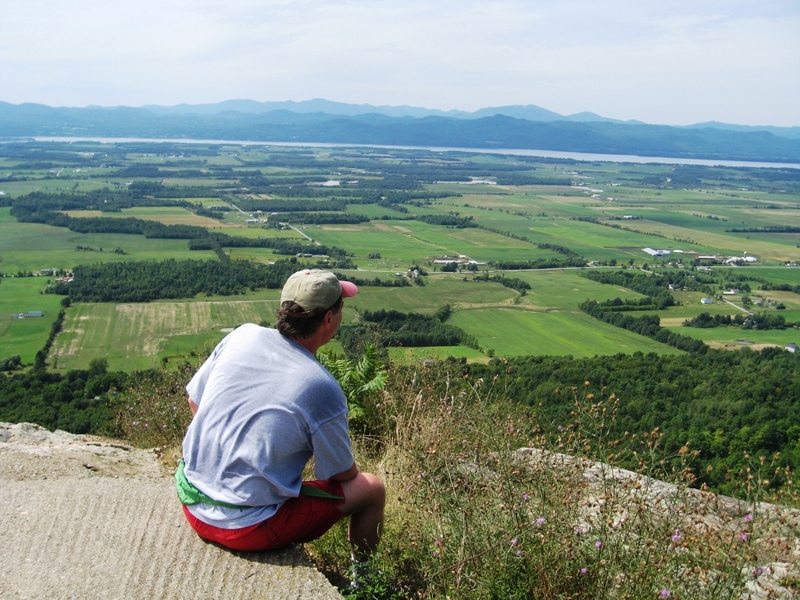 As you run across the summit, the trail veers to the left to the outcropping leading to the summit’s famed views! There is a large concrete slab on the summit, which was the result of an aborted attempt to build a private home on this great viewpoint in the 60’s or 70’s. 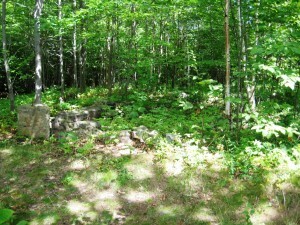 If you look around in the woods behind the summit, you can find the small foundation which is all that remains from a turn-of-the-century (as in 19th and 20th) hotel. Most of the old summit hotels of New England eventually fell prey to fires, and this one was no exception, but in an atypical way. A friend who grew up in one of the older homes at the base of the mountain, and has visited the summit regularly his entire life, told me that the abandoned hotel was actually intact well into the 60’s, but was eventually chopped up piecemeal for firewood by snowmobilers fueling their midwinter summit parties. He also mentioned the existence of a summit swimming pond built for the patrons of the hotel, so I will have to search for this on my next visit. After enjoying the view, reverse your path and let your legs move fast – you will get back down much more quickly than you ascended, but watch your footing in a few places. 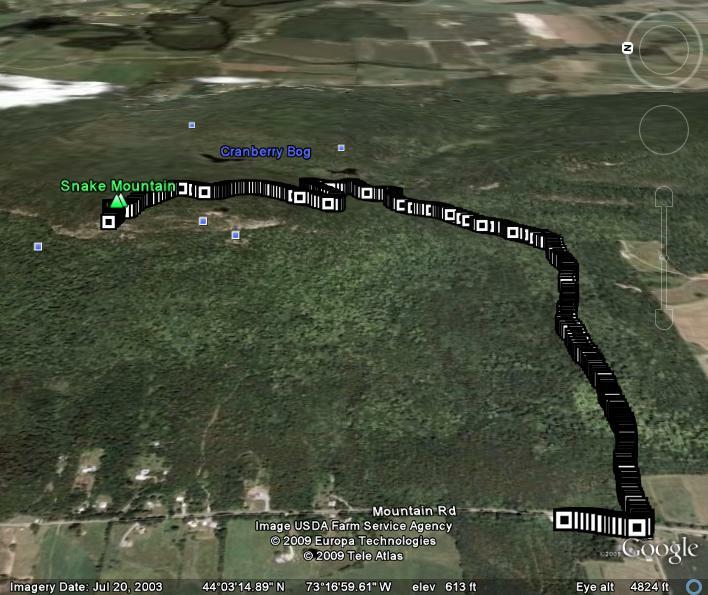 This run measures in at only 4.25 miles roundtrip (including a little messing around on the summit looking for old foundations), but involves a solid 1000 ft vertical climb and descent.